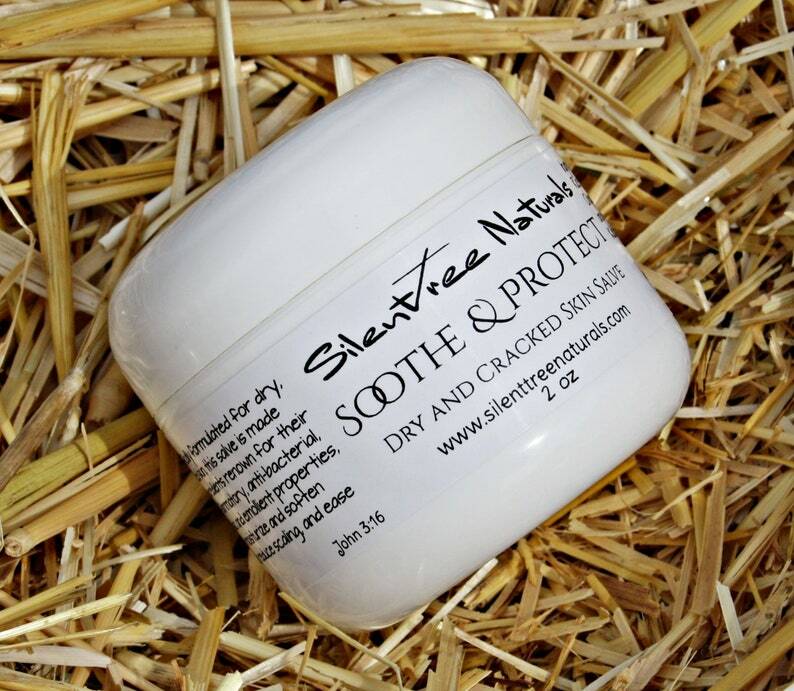 At Silent Tree Naturals, our products are hand-crafted from all natural and/or organic/organically-raised ingredients. Our products are chemical-free, paraben-free and cruelty-free. Specifically formulated for dry, cracked skin, this salve is made with ingredients renown for their anti-inflammatory, anti-bacterial, analgesic and emollient properties, to help moisturize and soften cracks, reduce scaling, and ease itching. Bacuri Butter contains a high percentage of palmitic, oleic and palmitoleic fatty acids, which provide its amazing emollient and moisturizing properties. Bacuri Butter is also rich in the amino acids L-Lysine. which helps to stabilize collagen and elastin production, making it beneficial in treating irritated/damaged skin . Castor seed oil contains undecylenic acid, which has germicidal and disinfectant properties. It is useful for skin issues and skin ulcers, particularly those caused by bacterial or fungal infections. Castor oil is also used to protect burns/wounds from infections, in treating acne and blemishes, in pigmentation issues, for reducing stretch marks and for dry skin. Kukui Nut Oil has been used by Hawaiians for centuries to protect and heal skin exposed to harsh, drying sun, wind, and water. The oil helps to soothe skin with minor sunburns, soften and moisturize dry skin, and alleviate the appearance of wrinkles and fine lines. The herbs used are known for their anti-inflammatory, anti-bacterial, analgesic and antioxidant properties, this salve will deeply penetrate to nourish the skin, while the beeswax provides a protective barrier which locks in moisture. The salve is unscented, however the natural aroma of the oils and butter, which is reminiscent of roasted peanuts, is a light smell that does not linger. May stain light fabrics before fully absorbed. *At times, I may have some inventory on hand, but in general these products are made-to-order. This will result in a longer turn-around time to receive your order. Please be aware of this before your purchase. If you need a product earlier then the anticipated arrival please contact me to discuss. I am not a doctor, nor do I play one on TV. While I do offer an alternative choice for personal care products, I do not claim to treat or cure any particular condition, nor do I take responsibility for your use of these products. I encourage people to educate themselves, and use common sense, when using these products, so please check the ingredients list before purchasing. Many traditional uses of herbs have not been validated by the FDA. Due to the nature of these products, there are no returns. I purchased this for my daughter in law and she said it worked so well and you don't need a lot for it to work. Thank You Silent TreeNaturals. Everything I've purchased from your wonderful store has been great and works so well. Love this product, it feels great on the skin. Shipping was fast! !